He was being honoured with an award as the "songwriters' songwriter" at the annual awards event in recognition of his half century as a hitmaker. 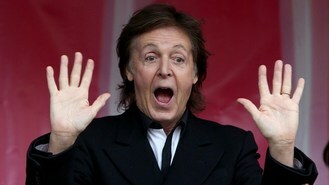 The former Beatle was given a standing ovation by guests at London's 02 Academy Brixton. Sir Paul said: "The great thing about songwriting is that you don't know how you do it, so you can't talk about it." He was presented with the prize by Blur and Gorillaz star Damon Albarn who said: "What can I say other I love him like millions and millions of other people. He's a lovely spirit and a beautiful human being." Albarn - about to launch his solo career with Everyday Robots, his debut album in his own name - was himself a winner, collecting the "innovation" prize for the continual reinvention of his career. Sir Paul was handed the prize almost 50 years since The Beatles first topped the bill at the NME Pollwinners Party, way back in April 1964. A year earlier they had been second on the bill as Beatlemania was beginning to sweep the UK. Sir Paul has previously been a guest of honour at the awards in 2000, picking up a prize on behalf of The Beatles who were voted the Best Band Ever, and in 2005 he collected the event of the year prize for his performance at Glastonbury the previous summer. The biggest winners tonight were Arctic Monkeys who picked up five prizes including best album for AM, best live band and best British band. They also landed awards for singer Alex Turner who was voted hero of the year and they landed the "best fan community" prize. It comes on the back of a double win last week at the Brit Awards for the quartet. Lily Allen was named best solo artist after a return to the spotlight following her "retirement" from the music business for a number of years. She said: "This is kind of dumb because David Bowie was in the same category, and Jake Bugg. This goes to you guys, not me." Scottish band Belle & Sebastian collected the outstanding contribution to music prize with guitarist Stevie Jackson playfully mocking David Bowie's Brit Awards plea for Scotland to remain in the UK. He joked: "England stay with us - at least just for a night. And if we do leave you, let's stay friends." Allen also presented the "Godlike genius" prize to enduring US band Blondie, fronted by 68-year-old Debbie Harry who continues to perform with the band and has been an inspiration to hundreds of bands since they graduated from New York's punk scene in the mid 1970s.